The Mastiff is naturally a good natured and peaceful breed of dog. It is extremely relaxed and surprisingly very gentle. This breed is a perfectly well-mannered house pet, however needs adequate space to stretch out when relaxing. The Mastiff is a particularly loyal dog to its owners. However, it is not exceptionally affectionate. The Mastiff is completely devoted to its family and can be great with children. In order to stay in shape, the Mastiff needs daily moderate exercise. This can consist of either a good walk or a nice run outside. This breed of dog does not take pleasure in being outside in hot weather. The Mastiff would much rather live outdoors in temperate to cool weather. Yet, even though it may be physically built to live outdoors, the Mastiff should really live indoors with its family so it can further fulfill its duties as a dedicated guardian dog. As a guardian dog, the Mastiff breed does tend to bark a lot at times. The Mastiff has a life span of nine to eleven years. There are a variety of health concerns associated with the Mastiff breed. Some of the major health concerns include CHD and gastric torsion. Some of the more minor concerns are elbow Dysplasia and cystinuria. Cardiomyopathy, allergies, vaginal hyperplasia, hypothyroidism, OCD, and PPM are occasionally seen in this breed, though not nearly as much as the major and minor health concerns. It is suggested that regular hip, elbow, and eye tests are done to prevent any possible problems. It is also important to note that obesity can be a problem if not treated properly. Deriving from the ancient mastiff group of dogs as the prototypical breed has created quite a bit of confusion. This has made it very difficult to trace the history of the breed. The Mastiff breed is undoubtedly of a more recent origin, even though the mastiff family is one of the oldest and most powerful breeds in the dog world. 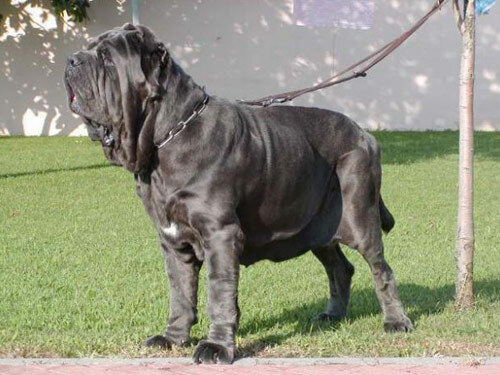 Mastiffs were used as war dogs and gladiators by the time of Caesar. In medieval times, this breed was used as hunting dogs and guard dogs, becoming extremely widespread and common. At a later time, taking from its origins, the Mastiff crossed over into the arena of dog fighting, bull baiting, and bear baiting. These types of events continued to be extremely popular, even after they were banned in England in 1835. The modern day Mastiff breed descends from both pit dogs and also, of a more noble history, the Mastiff of Sir Peers Legh. Sir Legh was wounded in the battle of Agincourt and his Mastiff stood over him and protected him for a number of hours during the battle. Eve though Sir Legh later died, the Mastiff returned to his home and was the foundation of the Lyme Hall Mastiffs. The Lyme Hall Mastiffs figured prominently in the founding of the modern breed five centuries later. It is believed that the Mastiff may have come to America on the Mayflower. However, the documented entry of the breed to America did not happen until the late 1800s. Even though the Mastiff breed was nearly destroyed in England by World War II, enough had been brought to America by that time to keep the breed thriving. Since this time, the Mastiff has slowly been rising in popularity.